Laser Dentistry | Oklahoma City, OK | Mark T. Hanstein, D.D.S. 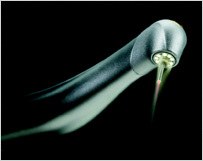 Laser dentistry or laser periodontics allows for the treatment of gum disease at any earlier stage. In addition, it can be useful to pregnant women and people with debilitating medical conditions. Dental laser treatment, often referred to as laser periodontal treatment, works well for treating canker sores and bacterial infections around teeth and gums.